The spouse is a member of the Dublin Food Co-op and knows it very well from her attendance at occasional comedy improvisation workshops held there. You’d be unlikely to come across it by accident – it’s in Newmarket Square near the Coombe, having started life many years ago in St Andrew’s Resource Centre in Pearse Street. The co-op is open on Saturdays (9-4.30), Thursdays (12-8) and occasional Sundays (opening times vary). I’ve only ever been there on a Saturday, so I’m not sure what the food offerings are on the other days. There’s a main cafe which serves a variety of pizzas, soup, fritatta, sandwiches, pancakes, cakes and beverages. Today, a fiver would have got you courgette soup, a small slice of fritatta, ‘amazing eggs’ on brioche, or tomato, rocket, mozzarella and pesto on toasted foccacia. However, we decided to get our lunch from a stall next to the main cafe called North Indian Gourmet Delight, which is run by this nice man here. 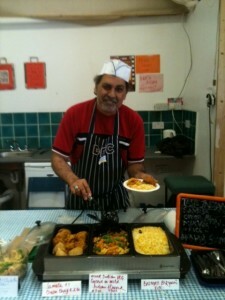 He sells bhajis, samosas, vegetable curry, and rice, to take with you or to eat there. We asked him whether he would make up a plates for us for a fiver each, and he graciously obliged. 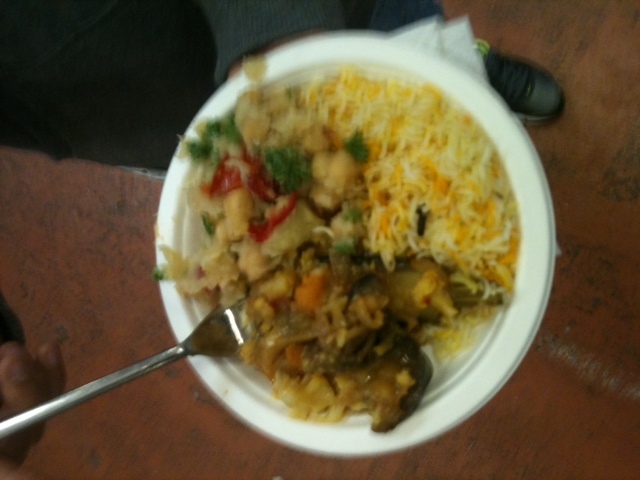 Each plate comprised basmati rice, a spoonful of vegetable curry and a spoonful of chickpea salad. 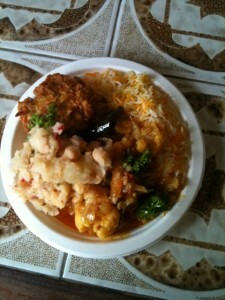 Actually, mine also contained a bhaji, but that might have been because I told him about this blog. I shared it with my dining companions. 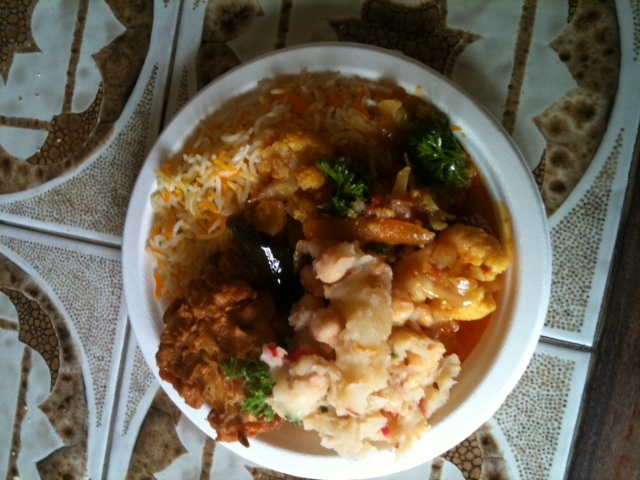 These were modest portions, but certainly enough for lunch. The food was warm rather than hot. Very tasty, though. We’ve bought bhajis from this man before. They’re a good size, nicely spiced and onion-sweet. The rice was well cooked but could have been a little warmer. 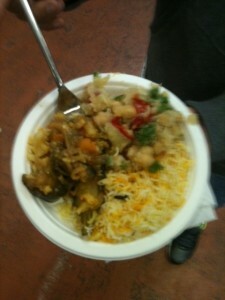 The vegetable curry contained carrots, onion, cauliflower, aubergine and fresh tomato. And the chickpea salad contained chickpeas (obvs), potato and slices of fresh chilli. Yum. We all enjoyed it. The co-op itself is in a large warehouse. On the left as you go in is a good-sized shop selling grains, pulses, seeds, teas, soaps and all the other goods you’d expect to find in such a shop. 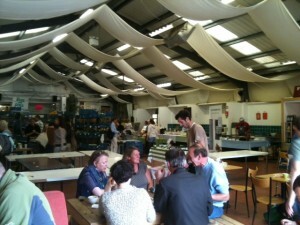 If you’re a member of the co-op (€25 a year) you’ll get a discount (but this doesn’t apply to the hot food stalls). In the main body of the building there are a few stalls selling a massive variety of fresh organic fruit and vegetables. There are also stalls selling baked goods, savouries, cheeses and other dairy products, smellies, jewellery and wine. 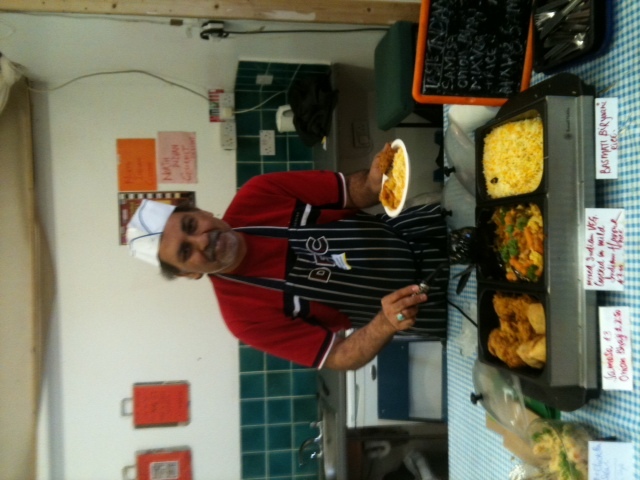 In addition to the cafe and the North Indian stall, there is another stall selling hot food – bhajis, samosas, spring rolls and so on. At the far end of the hall there are tables and chairs in a variety of shapes and sizes, where you can sit, eat, drink and chat. As you might expect, there’s a lot of natural fibre being worn and many of the older customers sport refreshingly undyed grey hair. There was a nice relaxed atmosphere about the place. We were there quite early (12.30ish) and it was quiet enough but the spouse assures me that it gets very busy at other times of the year so avoid trying to get a table at about 1. Do visit. It’s a nice place and well worth supporting. I knew I’d be able to eatforafiver somewhere on Parnell Street among the various Chinese/Korean/Vietnamese restaurants that have opened there in the last few years. I wasn’t wrong. The boys and I headed there this lunchtime. We parked on Hill Street just off the Gardiner Street end of Parnell Street and wandered around for a bit. We were tempted by a (misleading, as it happens) sign outside a buffet place offering ‘3 Chinese dishes and rice’ for €5. In actual fact, that was for a take-away option which wasn’t mentioned on the sign. That being said, the place was offering a substantial tasty looking lunch buffet for €7. Elsewhere we found a tiny place with two tables with interesting sounding dishes for €5 but rice would have cost an additional €1.50. 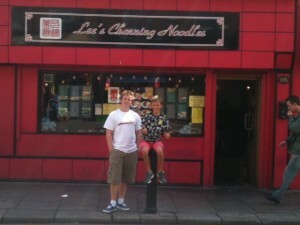 We had a look at ‘Wok in a Box’ and we’ll visit there sometime in the future. But for today, we settled for Charming Noodles, or Lee’s Charming Noodles. 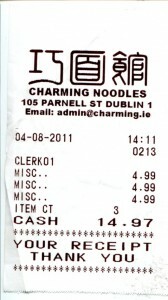 Charming Noodles, as you might expect, specialises in noodle dishes. It has several different menus on display. 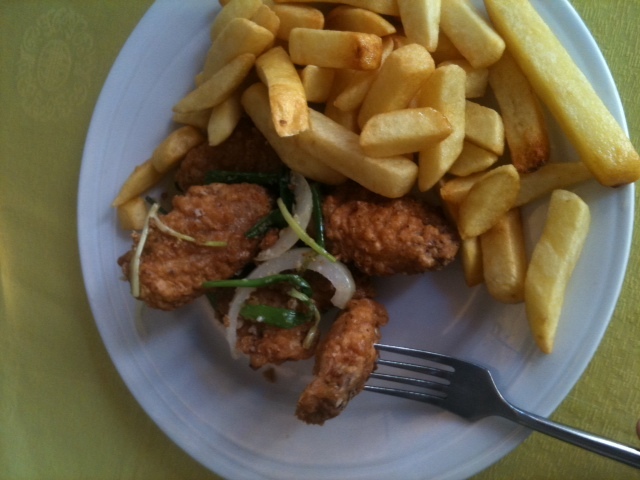 There’s a general lunch menu, offering two courses for either €7.99 or €9.99. There’s a standard Chinese-restaurant-fare menu, offering the sort of dishes that you’d see in any other Chinese place. There’s a very interesting looking Noodle menu, comprising soup noodle dishes, pan fried noodle dishes, chow mein dishes and noodle mixes. And there’s the Recession Specials, for a €4.99 each. The restaurant was a little over half full when we went in, but filled up to almost capacity while we were there. About half the customers appeared to be of far eastern origin, and most were tucking in to big bowls of noodles with gusto. It was the Recession Specials that clinched the deal for us obviously although on my next visit (and there will be one) I’ll be going for one of those delicious looking noodle bowls. The recession specials are available from 12 – 3, Monday to Friday. 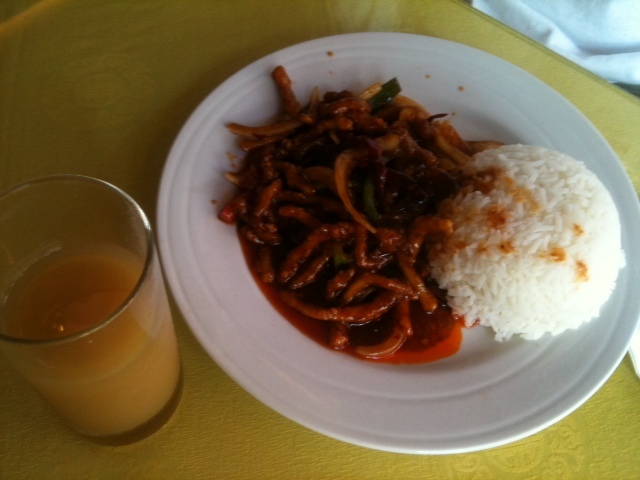 On offer are sweet and chilli squid, creamy chicken, salt and chilli chicken wings, beef with black pepper sauce, and sweet and sour vegetables (all with rice or chips). 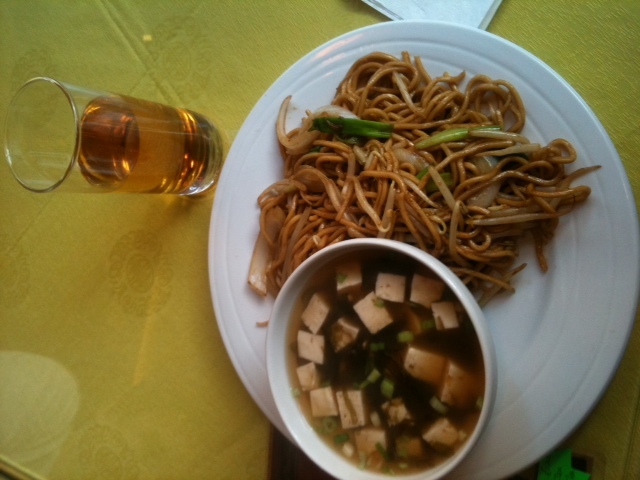 And also seaweed tofu soup with chow mein. For your fiver you also get a glass of either orange, pineapple or apple juice. The young lad opted for the chicken wings with chips, the big lad for sweet and chilli squid with rice, and I went for the seaweed tofu soup with chow mein. Eventually our food arrived. Mine first. The soup was lovely. Nicely seasoned, with light melt-in-the-mouth tofu and feather-delicate leaves of dark green seaweed. 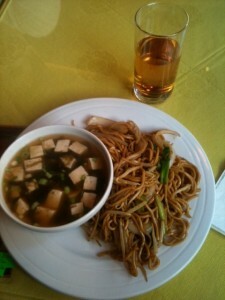 The chow mein was a little too oily for my taste but flavoursome and filling nevertheless. The quantity was generous. The big lad’s squid arrived next. The squid was tender and the sauce subtly spicy and quite tomatoe-y. The big lad was pleased with the quantity and polished it off with evident satisfaction. After a long wait, the young lad got his wings. He was a bit disappointed to be honest. The long wait, he felt, wasn’t really worth it, and he eyed the big lad’s squid jealously. 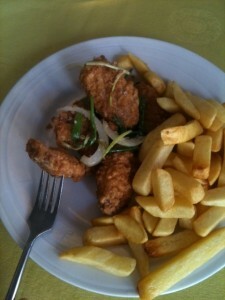 The wings were more batter than meat, with not a lot of chilli in evidence. The chips were fine, he said, but without much enthusiasm. Chinese restaurant chips always look and taste distinctively different from chipper chips, and these were definitely Chinese restaurant chips. I have to say, I’d go back, especially to try some of their speciality noodle dishes, which seemed to be remarkably good value and looked scrumptious as they emerged from the kitchen. 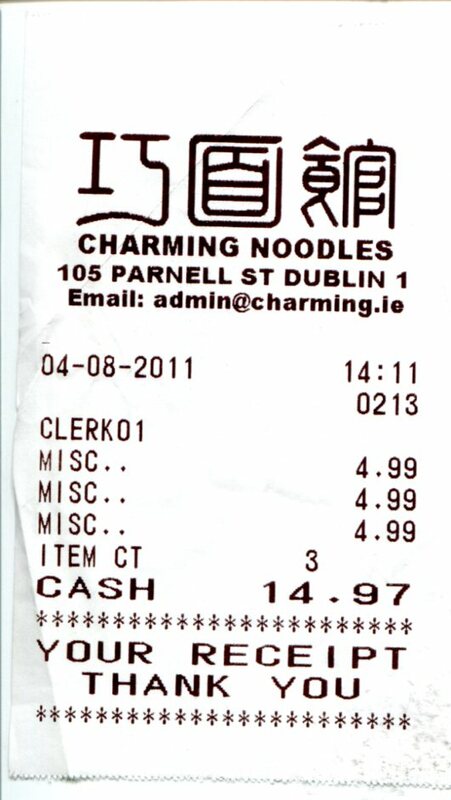 Most noodle dishes seemed to be priced at somewhere between €8.20 and €9.50, with a few above that. I think that’s pretty good. Parnell Street has been dubbed Dublin’s Chinatown. I suspect by people who have never been there, but like to think there might be somewhere vaguely exotic on the north side. Sure, there are a quite a few Chinese/Korean/Vietnamese restaurants and some oriental food shops there but none of the hustle, bustle, colour and atmosphere of the more established Chinatowns you’d find in different parts of the world. That being said, Parnell Street, Moore Street, Mary Street and Capel Street seem to be very much worth exploring for cheap eats generally. 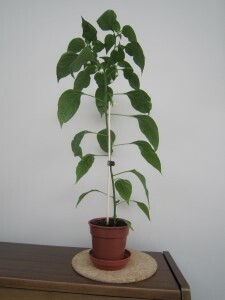 To change the subject entirely, I’ve been growing chillies. I bought a pot of seeds a few months ago in Homebase for €2.99 or so. They came with their own compost, so all you had to do was to sow them, water them, keep them warm and covered and, hey-presto, they germinated. I thinned them out, repotted the stronger ones and now have about 10 chilli plants on my window cill. 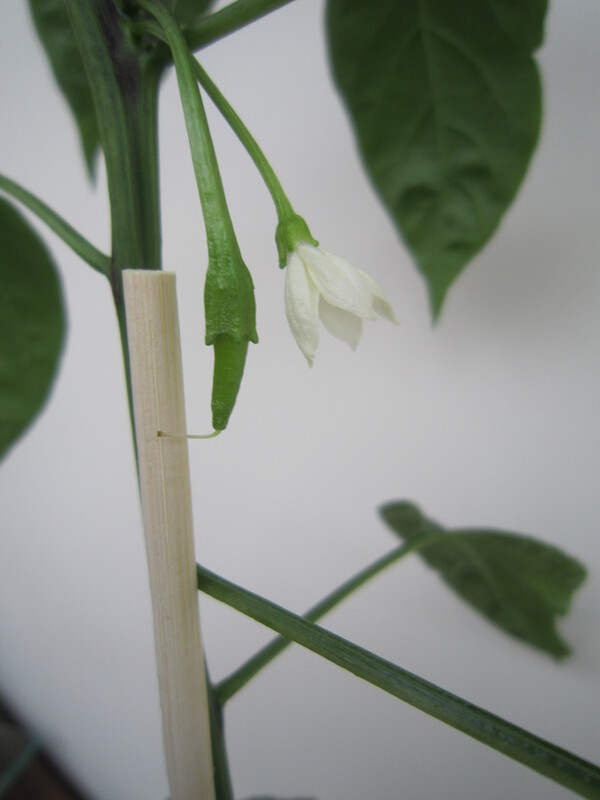 About a month later, I got a chilli from the fridge, cut it open, took the seeds out and germinated them in a similar way. I now have four more plants from that process. They are so easy to grow. Can’t wait to pick them and cook with them.